Not even Hennessey’s or Roush’s F-150s can match the absurdity of this thing. Tuned by ZB Customs and Kurt Busch, this 5.0-liter V8, two-door F-150 has twin On3 turbochargers, JE forged pistons, a Ford Performance forged rotating assembly, oil pan, and pump, and a side-exit exhaust. The result is more than 1,000hp, sent to the rear wheels only via a 10-speed automatic transmission. Naturally, the chassis and the suspension have been beefed up to cope, and there are gigantic Brembo brakes and sticky Goodyear tires, too. Flared arches widen this F-150 by 4.5 inches over standard, while a carbon splitter and deeper bumpers we’d imagine eliminate any residual off-road ability. Inside the seats, steering wheel, and armrests are all trimmed in alligator leather. Because why the hell not. 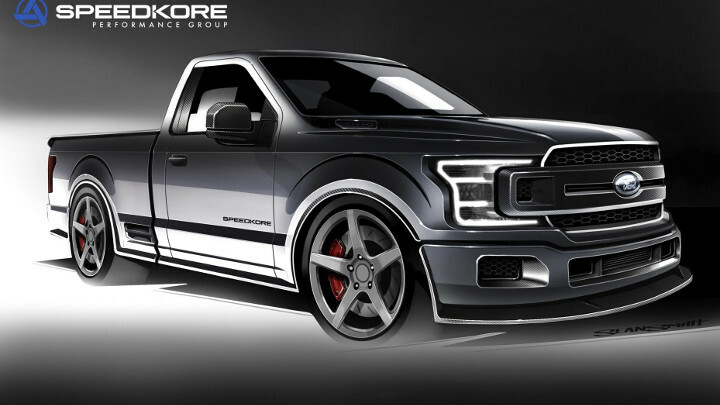 Speedkore went with supercharging instead of turbocharging for its 5.0-liter F-150, which makes a no-doubt-vast but unspecified amount of horsepower. 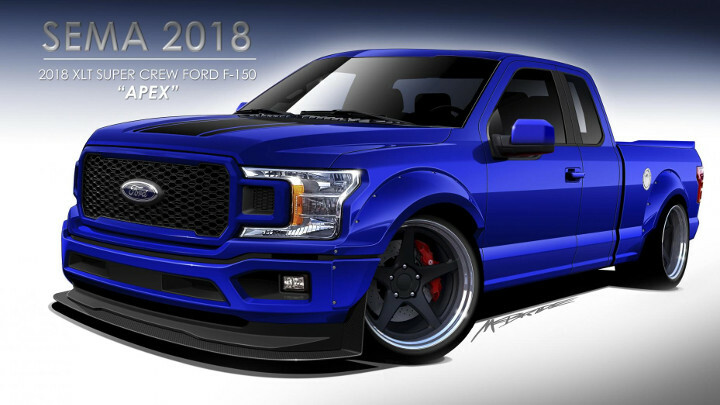 Based on a short-bed F-150 XLT, there’s also cold-air intake, a side-exit exhaust, eight-piston Brembo brakes, and lowered Crown springs with MaxTrac spindles. The wheels are 22 inches in diameter and shod with Pirelli Scorpion rubber. While the exterior is painted a stealthy shade of gray, the cabin gets brown ‘distressed’ leather with French-style stitching. Carbon features heavily inside and out—the front fenders, the splitter, the taillight panel, and the matching exhaust tips are all made of the stuff. Now we’re talking. 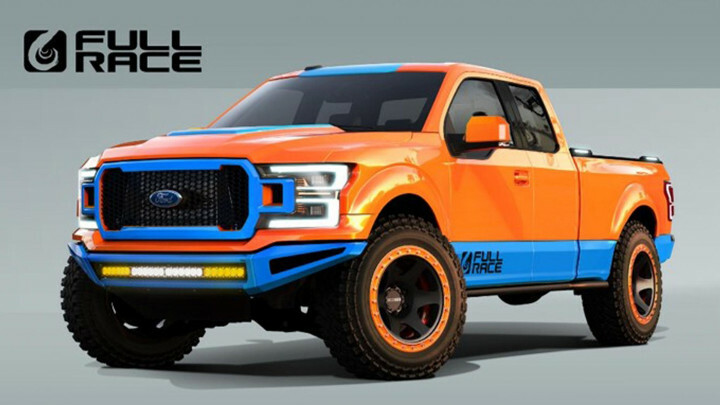 Full-Race Motorsports’ crew-cab F-150 eschews the V8 for the EcoBoost 3.5-liter V6 (as seen in the Ford GT), but with a full race-spec twin-turbo upgrade, a CARB-approved intercooler, cold-air intake, charge pipes, and a cat-back exhaust. Seventeen-inch bead-lock wheels are equipped with serious 37-inch off-road tires, over brakes from Raybestos and a serious-looking suspension setup from ICON Vehicle Dynamics. The orange-and-blue color scheme, a bit too Gulf Oil for us, masks ‘Enforcer’ bumpers, widebody arches, many LED lights, and a recovery kit rated to many, many tons. California-based tuner Transfer Flow based its creation on an F-150 fitted with Ford’s 3.0-liter V6 diesel engine. No doubt because it’s not all about speed, this thing. That much is clear when you look at the list of interior and exterior modifications. 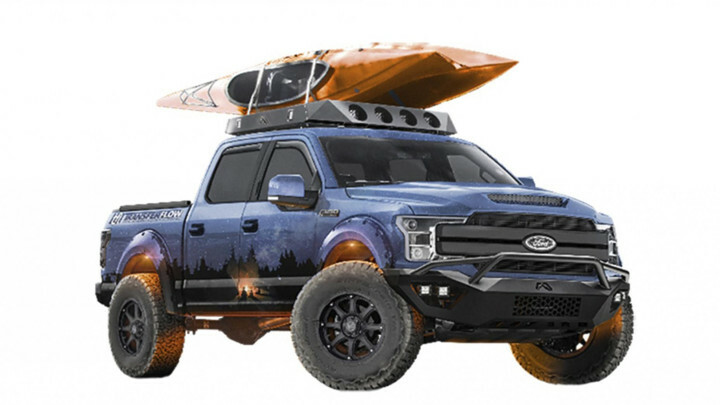 Together with the usual off-road suspension/wheel upgrades, this F-150 gets a special kayak rack by Yakima, plus hard-wearing front and rear bumpers, underbody lighting, an auxiliary fuel tank, a built-in toolbox, and even a projector (with screen) and a loud-as-hell Kicker stereo. Lifestyle-tastic. To that end, this F-350 has a slide-out games table, a beer cooler, a barbecue grill, and a large-screen OLED television and sound system. 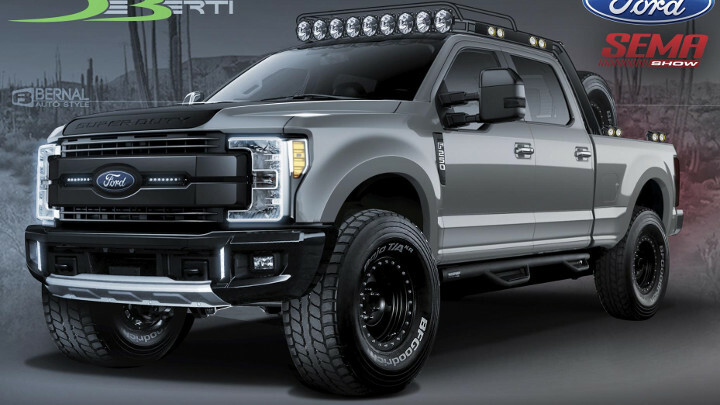 Underneath is Ford’s 6.7-liter V8 turbodiesel engine, plus custom height-adjustable air suspension. 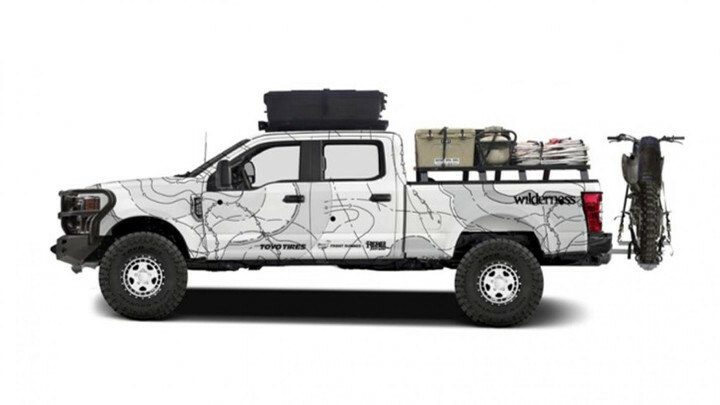 Wilderness Collective is not a tuner, but a company that runs motorcycle and UTV tours through Yosemite, the Grand Canyon, Death Valley, and so on. 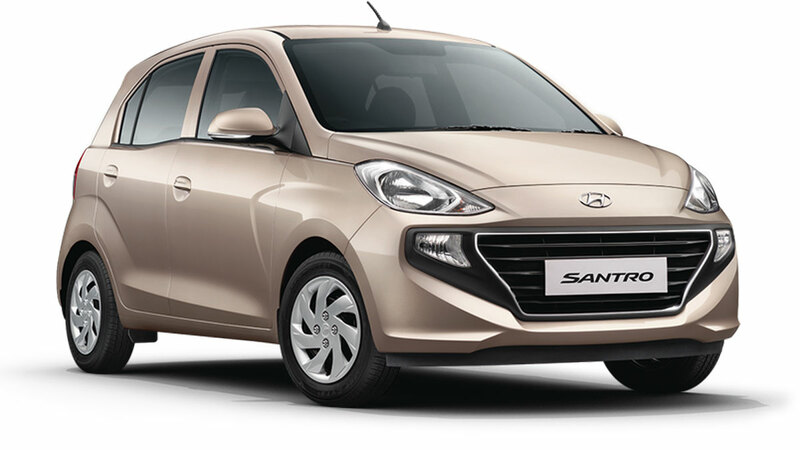 Which is why modifications made to its truck are more on the functional side of things. Lots of suspension work is backed up by heavy-duty front and rear bumpers with winches, a cab and bed rack, plus a rooftop tend, spot- and floodlights, and a proper radio-based comms system. Power comes from the 6.7-liter turbodiesel V8, augmented by a Ford Performance exhaust. This truck arrived at SEMA not on the back of another truck, as we suspect the others did, but having been driving as the crow flies through the Nevada desert. 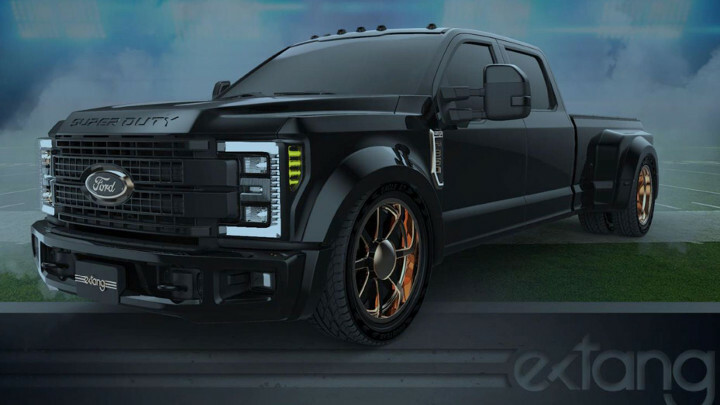 Another truck sporting the big 6.7-liter diesel—only this one has twin-turbos, an air-to-liquid intercooler, EGR kit, cold-air intake, and special exhaust for more than 900hp. Eibach coils, adjustable Fox shocks, Hellwig Products airbags, sway bars, and a set of BFGoodrich KR2 37-inch tires mounted to Ultra-Wheel beadlock wheels transfer that power to the road/sand/snow/dirt.